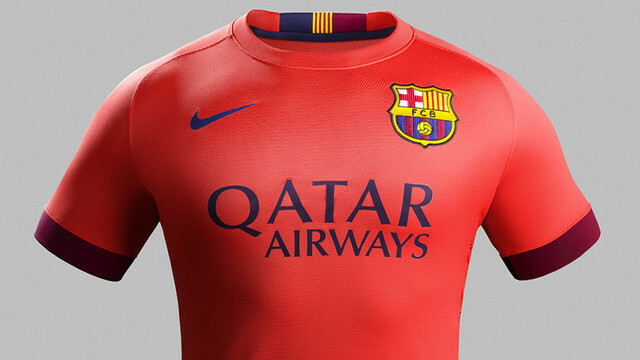 The shirt sports a crew neck collar and is entirely bright crimson except for the deep cuffs, which represent the Blaugrana with red on the front and blue on the back. On the back of the collar inside the neck is the Catalan flag the Senyera between FC Barcelona’s red and blue home colours, and this detail is repeated on the back of the collar, but with ‘Barca’ in blue and the club’s unique club font below it. Inside the back of the neck is a blue pennant tab with the club motto: ‘Mes que un club’ (More than a club) and their foundation year of 1899. The new away shorts are bright crimson with a thin blue stripe along each side, while the new away socks are bright crimson with a wide tonal stripe on the back. Each kit is made using an average of 18 recycled plastic bottles, and over the last four years Nike has diverted almost two billion of these bottles from landfills to produce their kits, which is enough plastic to core 2,800 football pitches. Nike took 3D body scans of many of the world’s leading footballers to create a kit with an updated and perfect new fit. The new fit allows the body to move more naturally within the kit, and so effortlessly improves players’ comfort and performance. The Nike Elite Match fit sock for 2014 also boasts a sleeker and updated design created especially for football.